Killer Samurai Sudoku is a combination of Killer Sudoku and Samurai Sudoku. They are merged together to create a challenging variation of Sudoku for the many sudoku addicts who want to solve more challenging puzzles. Melvyn Lawes a visitor to this site has created several of these puzzles and they can be downloaded along with their solutions below for free in a printable word document. In each coloured area there is a small number. This represents the total of all the numbers in that coloured area. To solve the puzzle you must make sure that every column, row and every 3x3 box in each larger 9x9 grid contains the numbers 1 through to 9. The puzzles above are in colour as it makes it easier to recognise the coloured cage areas. However, I appreciate the problems with printing in colour. So for those without access to colour printers I have produced a black and white version. At the moment only one of the puzzles is available as black and white as this is just a trial. I welcome your feedback on this puzzle below. 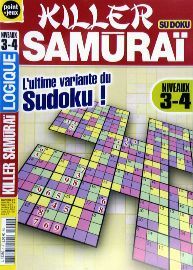 Multimedia Press in France have produced a new magazine which will feature the Killer Samurai Sudoku puzzles from this site. The magainze entitled "Killer Samurai Sudoku" l'utltime variante du Sudoku! is as far as Iam aware the first magazine to print this type of puzzle. If you are interested in publishing these puzzles then please get in contact. 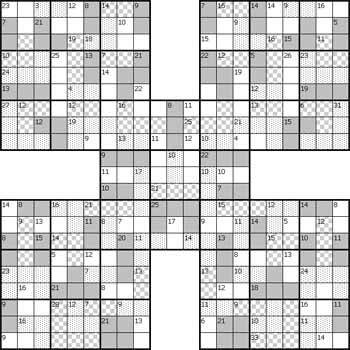 If you are interested in this advance and unique variation of sudoku then you can find more of Melvyn's Killer Samurai Sudoku puzzles and further developments at its dedicated home at: killer.4thewww.com. A new puzzles is added once a week. The page that used to be here along with the older comments has been moved/archived and can be found if your interested here. More puzzles can be found here. Publishers - Are you interested in publishing these unique Killer Samurai Sudoku Puzzle on a weekly or one off bases? If so please contact me with the details of your magazine/publication. Please make more killer samurai in black and white. Thank you ... the challenge is awesome. Comment 1 by az. Made on the 20th Nov 2012. Please could you e-mail me with the solution to Killer Samurai 24. Comment 2 by Michael Bannister. Made on the 10th Jan 2013. LOVE THEM ALL!!! !ITS MY CUP OF COFFEE. Comment 3 by EDROED. Made on the 11th Jan 2013.